Handcrafted ceramic model of buildings in Europe. It can be used to light a tealight candle. For larger pieces, a light bulb may be placed inside. Freiburg Rathaus was built between 1535 to 1590. It served as a University until 1901 when it was converted to a “New Town Hall” due to lack of space in the Old Town Hall. 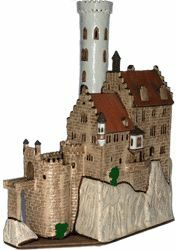 Handcrafted ceramic model of the Neuscwanstein Castle, Germany. Built by King Ludwig II in 1869 and located on a rugged hill above the village of Hohenschwangau in Bavaria, Germany. Serves as an inspiration for Disneyland’s Sleeping Beauty Castle and featured in films Chitty Chitty Bang Bang and The Great Escape. The St. Thomas Church was built in 1212 and is the home of the St. Thomas Choir. John Sebactian Bach, a famous German composer was the church’s choirmaster from 1723 to 1750 and his remains are interred in the church.